YXMYH 100 Pcs 3.5'' Plastic Flower Seedlings Nursery Supplies Planter Pot/pots Containers, Seed Starting Pots, Planting Pots by YXMYH at Tulips Orchids. MPN: 4336468000. Hurry! Limited time offer. Offer valid only while supplies last. Product Description Quantity :100 Pots. Material: plastic Nursery Pot dimensions : 3.5'' Inch Plastic Pots, 2.36'' Inch Bottom,3.15'' Inch Height. Nursery Pot dimensions : 3.5" Inch Plastic Pots, 2.36" Inch Bottom,3.15'' Inch Height. It is very light weight, soft thin plastic,it deforms under hands pressure, can be washed and reused. - Great for Doing lot of succulent propagation. - Great for planting cuttings. - Can also be used as transition pots. Order Your Own 100 Pcs 3.5" Plastic Seed Starting Pots By YXMYH Right Away! 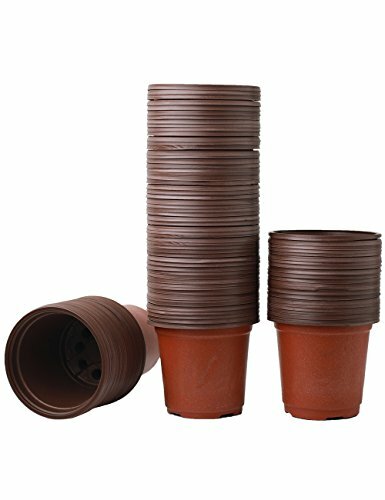 Seed starter pots quantity :100 pcs Plastic Flower Seedlings Nursery pots 3.5". Nursery containers size :3.5" Inch Plastic Pots, 2.36" Inch Bottom,3.15'' Inch Height. Plastic Pots for Plants,Cuttings & Seedlings,Plant Seed Starting,Great for Doing lot of succulent propagation,great as plant transition pots. Perfect for plant starts, It is very light weight, soft thin plastic, it deforms under hands pressure.Flower pots are suitable for balcony, can be washed and reused.